My dog Ace is super lazy, and I love that about him. Ace is perfectly fine with a 20-minute walk each day, and he doesn’t seem to mind if we miss a day or two. He’s a nice balance for me, because I tend to get obsessive about exercise. Of course, a lot of dogs require much, much more exercise than Ace. My puppy Remy seems to have explosive energy. He continues to shock my senior pets and I every day as he continues to just go-go-go! So, I reached out to some owners of “supercharged” dogs and asked how they manage all that energy. 2018 Update: My senior dog Ace has passed away. Jen deHaan says she has yet to completely wear out her dog Mort. If left to his own devices Mort would probably run and play until he collapsed, according to deHaan. “I’ve taken him out to a regional park with a lake and hills to run up and down, and he swam and ran full speed for over three hours,” she said. Read more about Mort and deHaan at DOGthusiast. “There is no way on this earth that I could tire him out by leash walking alone,” said Linda Liebrand about her dog Alfie. She said she thinks of him as a small nuclear plant or a self-charging battery. She said she tries not to miss walks with Alfie because he would likely turn into a really stressed and poorly mannered dog. Bonnie Joy Dewkett and her husband are the owners of two dogs, Roxy and Summit (pictured). “We are not either dog’s first family, as they were both given up previously by people who couldn’t take the activity level,” she said. She takes her dogs walking, running or hiking on average about 15 miles per week. 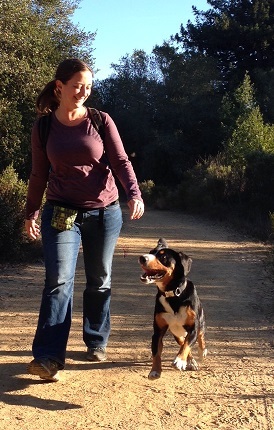 We highly recommend running with a hands-free leash and a sport dog harness from Mighty Paw. This system allows your dog to pull you and gives him a great workout! Natalie Maniscalco adopted her dog Mia from the Bidewee animal shelter in Manhattan. Her 5-year-old dog has slowed down a bit these days, but she used to exercise Mia for at least an hour a day. This would include running, walking and throwing a ball. Another trick she uses to tire out Mia is to play tug of war. She said Mia likes to pull, shake and twist at a rope or other toy. See more dog exercise tips here. On her walks with Alfie, Liebrand (pictured right) tries to vary the locations as much as she can, as that adds to her dog’s mental stimulation. Finds spots to do some “urban agility” such as getting Alfie to jump up on a park bench, balance on a low brick wall, sit on a rock, etc. Plays games of fetch on land or in water. Works on obedience skills such as heeling, coming when called, etc. She and Alfie also particpate in nose work classes, which she said is a brilliant activity for high-energy dogs. 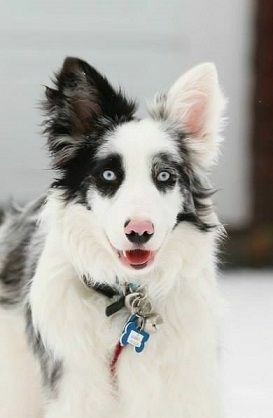 Mort and deHaan are also involved in different activities such as flyball and disc dog, and deHaan suggests other dog owners look into dog sports as well. “These activities help you develop a strong bond with your energetic dog and keeps him content during down-time,” she said. “It really is the best command in the world as it teaches your dog when play time is over,” Liebrand said. She taught Alfie the command by saying “finished” when she wanted playtime to end. Then she would give him a treat and walk away. “The dog will quickly learn that playtime is over when you say so,” she said. I actually use a similar command with Ace – “that’s enough!” – to signal when fetch is over. If you’ve recently adopted a hyper dog, the best thing to do is take the time to tire him out, according to Dewkett. It will make your life so much easier! “If you can work out with them first thing in the morning, even better,” she said. And for anyone thinking of getting a high-energy breed, Liebrand said if the dog books say the breed may need an hour of daily exercise, remember that a puppy or young dog of that breed will have even more energy. 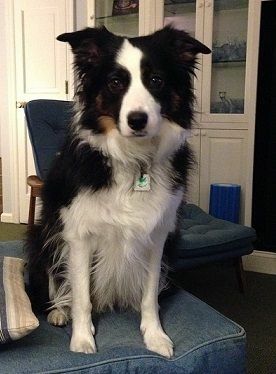 Dewkett recommends puzzle-type toys throughout the day, which is what she gives her border collies when she’s in meetings and can’t pay attention to her dogs as much as she’d like. For deHaan, high-energy dogs are incredibly fun and worth the extra work in training and activity, but they’re not for everyone. “Make sure that if you choose to adopt a dog like this you’re ready for a bit of an extra time commitment when it comes to keeping him or her busy and content,” she said. Do you have a high-energy dog? How do you tire out your dog? I wish this post existed two years ago when we first adopted Faolan! He has mellowed out quite a bit, but still has his incredibly hyper moments. I didn’t realize he was the most active of your three, but now that I think about it, that makes sense! I’m thinking about adopting a puppy this summer and I’m super stressed, overthinking it all. I have a doggy backpack ready and am willing to invest in a second hand treadmill. Also, I’m hoping to bike with my dog and do bikejoring (I bike every day to and from my child’s school, two round trips of 6 miles total and would love to take a dog with me). Definitely hiking, beach days, and doggy playdates or daycare. Thanks for the tip on trying out the dog sports! But there are days when you’re too busy/lazy/sick so teaching your dog to chill out on command would be helpful. As you know, I think teaching solid obedience skills is key as well. That way you can at least get the dog to lie down and stay when you can’t pay attention to her. Gosh, biking to school and back every day would be ideal for the right dog. I used to bike with Ace in his younger days. It was a great way to exercise him. Definitely used the dog backpack a lot too! Can’t wait to hear more about your potential puppy! We fostered a young hyperactive terrier mix and the best thing I could do for him was teaching him how to relax. He had no off switch, no basic obedience, no manners, no impulse control, was not even potty trained. So we focused on that. He had to work for every handful of kibble by sitting for it for at least a few seconds. He was literally shaking all over, it was that difficult for the little guy. We also used the crate a lot. Aww, poor guy! Well, actually he was lucky because he got to live with you! Thanks, Lindsay. 🙂 Our whole family, including the other foster dog, was often frustrated with him. It was a good exercise in patience for all of us. I’ll be honest,if I wasn’t retired I may have rehomed my Sheltie girl. She will go until she drops,but with proper excersise she will settle nicely in the house.We do woods and trails seven days a week and we do between two to five miles a day.On the trails we retrieve sticks and Chase Squrrels .We also compete in agility and obedience. I’m glad you were able to keep her, but I’m sure she continues to be challenging! 1. Anything with wheels that gets your dog moving faster (like they want) instead of slower (how we walk or run to a dog) – bike attachment, scooter, skates, etc. 2. Playing with another similarly matched dog – dogs will tire themselves out chasing, running, and playing with one another if you give them the space and opportunity. This is especially true as a play date or meet-up that is limited to a space and dog(s) you’ve chosen, not just hoping some random dog will nicely play with your dog at a park. 3. Flirt pole! This can be the greatest toy ever for prey motivated dogs. In 20 minutes, you can exercise and challenge the dog in a way that 2 hours of walking won’t do. Note: You need a solid “drop” command, some form of stay/wait, and it’s not recommended for dogs whose prey drive is creating serious behavior issues already (stalking kids, vehicles, family cat, etc.). It’s a dog toy that has a toy attached to a long stick so you can “tease” them with it and encourage them to chase it. Almost like a cat toy. Oh wow, that’s a creative way to add extra exercise! We live with herding breeds and although walks are great, they don’t do the job for our pack so we play games in the yard. We have the property so they get lots of running done. We use flyers and balls. Sometimes we just throw things back and forth and let the dogs race to catch them before we do (important to dive out of the way). Having them figure out where we’re throwing, where the wind will take it and when they need to jump to catch it seems to wear them out. What’s funny is that they never get tired of it. Everyday, they run to the side yard to play. Hilarious. It does take at least an hour (broken up) to wear them out. I bet it helps that your crew can run around and chase and play together. You’re also so lucky to have a great yard for them! Jealous. Great post and advice. Luckily, my seniors are content with short runs and leash walks. Mom has yet to find a dog she could not tire out. All her dogs have worn down within a time of living with her, all our guest dogs have worn down within a few days of arriving. Even Labs seem to get tired out. We don’t do Border Collies or that type of dog as they make Mom nervous with their herding behaviors. She doesn’t like that or their constant demand to please. We prefer high energy independent types. Running and walking has always been the best medicine, but nose work is a wonderful way to tire us out fairly quickly as it is a great mental workout. Running and walking is what I typically do to tire out my foster dogs/pet sitting clients as well. And if the dog is friendly, an adventure in a fenced dog park also helps tremendously! Great tips. Sometimes I forget that mental exercise is important, too, and definitely tires a dog at least a bit. I should work on providing more of this. I find that just having my dogs outdoors tires them out. Just like when you’re raising kids, getting them outside really helps tires them out! Walking my dogs is easier now that the weather is nice, so no more excuses. 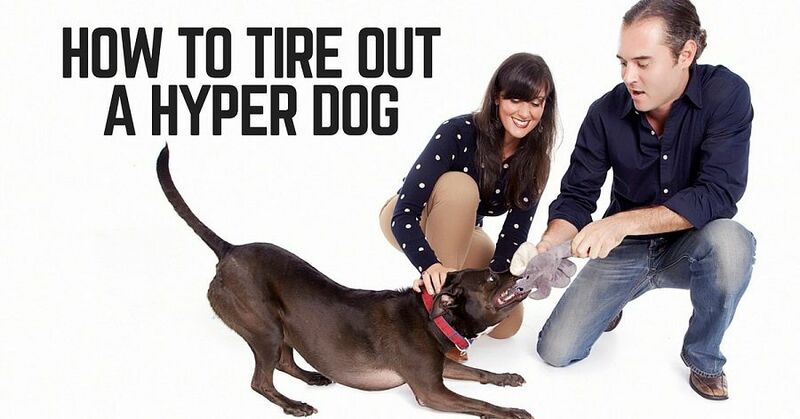 I can see how having a hyper dog would be quite a challenge for most of us. Another reason to think about what kind of dog you’re choosing. I still can’t understand how my supposed “border collie mix” is the laziest animal I’ve ever owned. Sleeps more than a cat, couldn’t care less about playing fetch, and has no interest in running more than a few miles. She’ll go on long walks when it’s not too hot, but when we’re at home she spends 90% of the time napping or looking out the window. Interesting! Just goes to show every dog is an individual, regardless of breed. My daughter has an australian/bassett mix. Pretty laid back. Those bassett genes are mellow ones. I’ve figured out that the “dogs required to keep up with Ruby” is a 3:1 ratio. Boca and I take turns entertaining her now, but it is never enough! I always say a tired dog is a happy dog! And a Happy owner :)!!! Dear Lindsay, I have a 5 year old mixed breed dog. I think she is terrier mixed with another terrier. I’ve had her since she was 9 weeks old and have worked with her house training constantly since. I’m not able to take her out so she uses puppy pads. The problem is she has been untrainable to the degree that I’m about to give up and give her away if I can’t get good results soon. I’m getting too old to be able to keep cleaning up after her constantly. She knows what to do, it seems. She knows I’m happy with her when she uses the pad, she will even show me if she’s been “a good girl.” If she’s been bad she shows that too, by acting guilty. Missing the pad, as with two feet on and two feet off the pad is understandable, although aggravating. The problem at least half the time, she down right wets on the bathroom floor, where her pad is placed. She will wet 2 feet before she gets to it or she will wet right at the intrance to the bathroom, which is on my bedroom carpet. She will not wet on the pad if she poops on it first, so I get her the 27×30″ pads and put two down. Strangely enough, she will not poop on the floor, ever! No matter what I do she will not be trained. I say this is due to her being stubborn since she knows where to go and knows she’s going to be punished if she doesn’t use her pad. I have used praise, treats and praise, ignoring it, and punishment. Nothing works! She just has no fear of any punishment, or enough joy for praise and treats. I have tried everything I know of and have worked very hard trying to train her. I don’t know what else to do. She’s very smart and she will follow some commands, unless she is excited over having people visit. She loves people and seems not to hear me then. There seems to be a thing about what she poops on and what she wets on because when she is outside she will wet on the grass but she will poop either on my or a neighbors porch or on the sidewalk. Why? There has to be a reason! She doesn’t mess up anywhere else in the apartment. I’ve been working with her for 5 years. I have had two other dogs, (puppys) that I have completely house trained by the time they were at least 4 months old and no later than 6 months. They made mistakes but very rarely. Do you have any advice, I’m desparate? It’s hard for me to give her up because I worry about how she will be treated or worried she would be left outside alone and in the cold and that breaks my heart. Should I try to limit her water intake, maybe? I have a real dilemma here because I have this worry and being stuck cleaning up after her the rest of my life. Please, if you can, HELP. Hi Joyce. First of all, how frustrating! No one wants to clean up after a dog day after day. Obviously I don’t know your exact situation or what exactly you have tried, but I will give you a few ideas and link to some of my potty training posts in case you haven’t seen those. Hopefully you can brainstorm something. My first advice is to hire a trainer to come and give you some ideas. It’s worth the cost if it will save you some stress, time and frustration. There are a lot of good trainers out there. Second, don’t assume she knows what to do. If she is peeing where you don’t want her to, then that tells me she doesn’t understand what you want. It almost seems like she thinks she can go anywhere on the bathroom floor. Next, start over with the basics as though you just adopted her today and she knows nothing. So, take her to the correct spot (the pad) every couple of hours and reward her with highly valued treats for going in the correct spot. Use hot dogs, pieces of steak, etc. If she happens to go in the wrong spot, ignore that, get her onto the pad and reward her there. Keep her on a leash when you are home so she can’t go in there and pee on the floor. Go with her every time and reward her for going on the pad. When you are not home or can’t supervise, put her in a kennel if possible to prevent her from peeing on the floor when you’re not around. Thanks Lindsay, It makes sense to start over as though she wasn’t trained at all. My sucesses in puppy pad training a new puppy was to make a trail of pads or newspapers from a place where the puppy sleeps to the place you want her to go. Little by little you pick up the pad nearest to the puppy, starting with the one nearest where she sleeps, making her have to go to the next pad or paper. Give it a few days before you pick up the next one. Continue picking up one at a time and they learn to go to the next pad until they get to the last one in the place you want them to go. That has worked for me with all my babies, and with this one too, except she doesn’t seem to get that she needs to pee on the pad too. She seems to want to find another place to do that, most of the time if it’s not the pad, it’s in the bathroom floor where her pads are. Sometimes she does like she is supposed to do. I always reward her for that. Maybe I have been confusing her some way. This is an active dog, she wants to be the center of attention and she can be stubborn but I believe if I find what I’m doing wrong she will be ok. She is a good dog, she’s smart, she’s learned to mind me pretty well, and she does funny things and that makes me laugh and cheers me up. I am willing to start over or try anything I haven’t tried. Thanks for the websites. what is a flirt pole for dogs>????? For some reason, I was thinking it was a stripper pole of some kind! LOL!! I thought, wow……..you can teach a dog to do THAT???? Have you checked his thyroid, or his blood sugar? Last winter my sisters pure breed beagle have birth to seven beagle, mastiff , Rottweiler mix puppies. When I took my dog snoopie I had done my research and found this mix needed a lot of exercise. I never could have imagined just how much that would be. I quickly lost 10 pounds of extra weight in the first few months I had him. As a young puppy he was going for 10-18 short 1/4 to 1/2 miles walks per day. By the time he was 7-8 months old we had our walks down to about 8-10 times per day. This quickly progressed to runs. Last summer we wer going for 3-5 one miles runs/jogs per day as well as 3-5 one to two mile walks per day. I found him to be more destructive over all on the days he does not get this exercise. We take him hiking and camping a lot in the warmer months as well. This is where we allow him to run free. When I fostered a high energy dog (I am not a high-energy person! ), one of the things I did with her was “stair fetch.” I’d throw a soft toy or ball (soft enough not to bounce) up to the landing at the top of the stairs, she’d run up and bring it back down, and I’d throw it again. For her, 4 or 5 reps were enough, but some dogs might like more. Caution, though – don’t do this for a puppy, as it might injure still-growing joints. I also have a high energy dog. My Nakita is a Blue Heeler/Australian Cattle Dog. She loves to go for long walks especially in areas where we can let her off her leash. If she has to stay on the leash, she acts like she’s totally exhausted and literally drags behind us. Otherwise, she runs like crazy. I’ve tried to set up an activity course in my yard with seesaws, tunnels, stairs, and jumps, but she refuses to use any of them. She loves her wading pool and chasing the water from the hose up and down the yard as well as in circles, but refuses to play in the sprinkler, the rain bird or go swimming in lakes or the ocean. She does love running in the loose sand at the beach. Any ideas on what else I can do to tire her out and get her the exercise she needs? Do you have a dog backpack she can wear on walks/hikes? No, I have tried to put on her at the pet store and have her walk around with it on, but she fought it the whole time. She won’t even wear her raincoat on real bad days. I think it may have something to do with the breeder I got her from. She was always correcting the puppies with towels being hit on their backs or on their heads. I didn’t know this until the day I picked her up, this was after I’d already paid a substantial down payment for her. I hoped I could get her over that treatment with reconditioning, but nothing has worked. She has calmed down quite a bit, but still hates anything on her back or on her head. Oh gosh! What a strange way to correct a dog! Would you feel comfortable taking her running next to your bike? Also, letting her run on a long 30-foot rope in areas where she can’t be off leash. Just brainstorming … how about an agility class or even an obedience class? Some dogs crash after so much “thinking.” Also playing tug or “find it” games by hiding treats around the yard, under boxes, etc. I know some people recommend a flirt pole. Also, walks with other dogs on or off leash or a playdate with another dog. Or even training her to use a treadmill if you happen to have one. 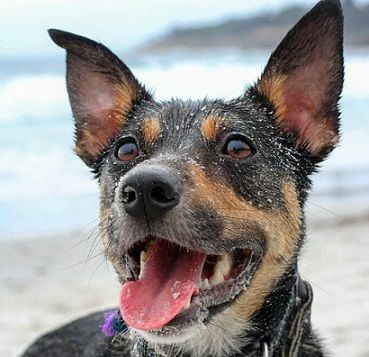 I lost almost 10 pounds the summer after we got our cattle dog/kelpie mix. He was not a puppy when we got him, thankfully, but he still needed tons of walking. 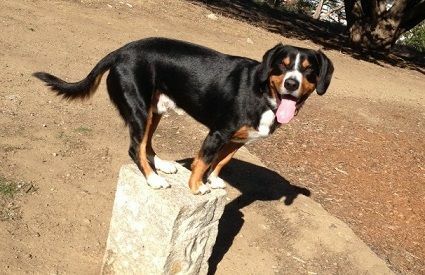 Unfortunately he is not a fetcher, nor is his recall very good, so the “easy” ways to exercise him are out. We walk him 90 minutes a day on a retractable leash so he can run around on it. He loves tug of war and wrestling. He likes chasing us in the backyard or chasing things we throw for him. He loves his kong and other puzzle toys (but ran away in fear from the flirt pole we got him!). But it can hard on rainy days and we have lots of those in the northwest! I am always on the lookout for things that will entertain him — toys, games, etc. This summer we are going to take him to agility classes, which he is sure to love. Perhaps obedience classes or agility or nosework classes? Maybe some puzzle toys or playing “Find it” games by hiding treats around the house, making her wait first. Maybe having her wear a dog backpack. Also, just visiting a dog park if that’s appropriate for her really helps drain some energy. Doggy daycare? 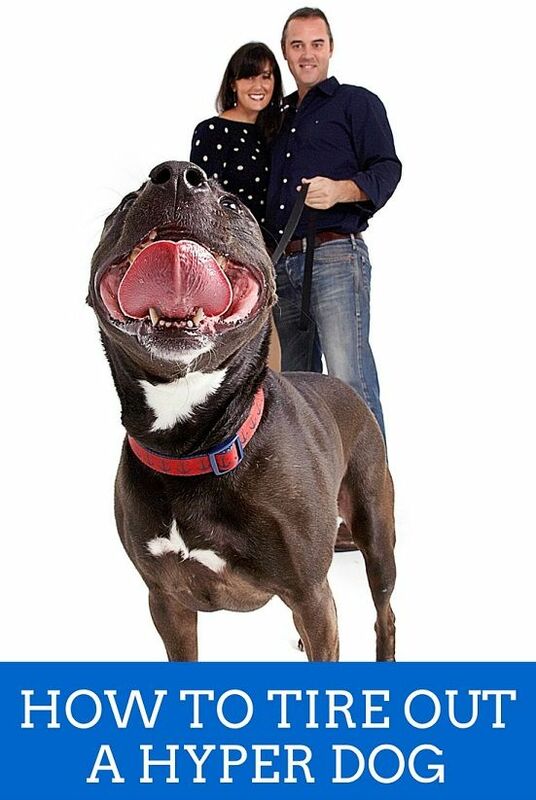 Hiring a dog walker? Lulu our 2 year old rescued Staffy is one of those difficult to tire out dogs. In the house, unless FRAPing, she’s pretty relaxed at this point. We’ve had her nearly a year and a half. We’re finding that it takes the perfect combination of walking (making her heel), training w treats, and running (usually w a bike) gets her to a relaxed , spent state. While we’re at work we even have a dog walker take her for walks. She gets to walk w all kinds of dogs from big to little. That also mentally and physically stimulates her. It seems that if I get her to an excited state, that doesn’t help to drain her energy. It just breeds more excitement. So a combo of mental exercise combined with physical works great! Good point and reminder that so much of it is about challenging the dog mentally. Could be training, visiting new places, being around other dogs, etc. Thanks for all advise. We recently got a whippet puppy and she is extremely energetic. Completely different to our second dog who is jack russell cross. We tire both out by walking and fetching but thinkig about different solutions 🙂 The best way to tire them out is letting them play for 5 minutes running around the garden sometimes… 🙂 🙂 And every weekend we hike together. They are definitely knackered after! Hello we have a high energy 4 month old Australian Shepherd named Chewie.He loves getting on the trampoline.He runs around very fast and chases a ball.He begs at the opening & we pick him up & put him in there, it has a safety net.This wears him out! We adopted Ben (a Border Collie mix) last year and OH BOY I thought I was ready for high energy. He was out of control. No impulse control, struggled to find an off switch. In addition to being a higher energy dog, he was also SUPER stressed out (we were the 8th place he landed in about 3 months when you figure in shelters, more than one foster home, and one failed adoption, making his way from NC to NJ to NY) and he’s a dog who stresses UP UP UP. We took a lot of long walks (he got about 4-6 miles of walks a day), threw a lot of balls in our backyard and let our other dog chase him into exhaustion. Because he was so stressed he just didn’t know HOW to settle and his brain would not stop working and so it was constant running around the house with squeaky toys. I had to put him on leash and keep him close to my side and once his options were limited to nothing, he would drop into an exhausted sleep. And do it all again the next day. It took him some months but he’s finally settled into a dog who is content with a 2 to 2 1/2 mile walk in the morning, some ball play and training (agility, mostly, though I do plenty of impulse control training with him still! ), and watching out the door to make sure we’re not attacked by squirrels. He settles beautifully in the house. But OH those first months were a nightmare! Ha! Sounds so challenging but you put so much work into helping him. Thank goodness it paid off! I sometimes have to just put Remy on a leash too or in his kennel and he’ll crash. Otherwise, he just keeps pacing around with a toy in his mouth. Remove the options and they do settle, at least mine does. I adopted a 2yr old pit/ border collie mix. not miss a day if it rains ever! We have a 2 1/2 year old German Shepherd mix who we adopted 6 months ago. Hr is you g and high energy and we used to counter that will 3 walks a day and some light running. But we found out a couple months ago that he has hip dysplasia with bone spurs. We had to shorten his walks and stop our daily runs. He’s in training classes but what else can we do without aggravating his hips? 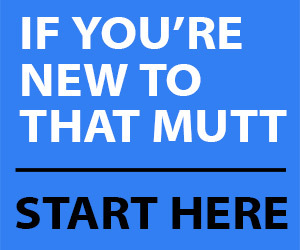 I love this article, the advice is very help full I just started fostering a new dog she’s about 2 and she is FULL on energy I will defiantly be using these tips on her! I have a 2 1/2 year old yellow lab (Emma Lou) and she full of energy all the time.She loves to work all the time.I`ve learned how to turn her on than turn her off.It works great.I tell her “it`s work time” and she`s ready to go.We do lot`s of thing`s for work.Learn a new trick,lake time to swim,fetch at the park,hiking,etc.When I want her to calm down I tell her to “take it in”.Don`t know why I chose those commands but they work.I do know that when I tell her to take it in I have to take it in too or she`ll give that look.She`s giving me the “It`s work time”look right now while I`m typing this out.I guess it`s work time. i am thankful that my girls are not real high energy. i dont really have the time to tire them out. they tire themselves out playing together. we do run and walk daily and we play in the house and on the big deck. a friend of mine has a Goldendoodle and she is very high energy. she has not even slowed down now that she is a few yrs old. when she was a puppy she wanted to play and run constantly. i think agility or obedience classes are great for high energy dogs as well as any dogs. but with agility they get lots of exercise. OMG……Emma Lou is crazy with energy.Early in the morning(about 5am)we get up.We go jogging for around 45mins to an hour.After that if I have other dogs to walk on that day I`ll go get them and we walk for a least another hour.Than I will take care of my business for a few hours.Pickup another dog and repeat.Depending on the day and what dogs I`m walking/jogging with,this goes on all day.She never tires out.I tell her to “take it in”and she knows it`s time to stop and rest.I sometimes have to turn away while say “take it in” so she knows I don`t want to engage anymore.I love my Emma Lou but I wish she came with a on/off switch.I`m 57 years old and my on/off switch as a slow-mo setting with it.she don`t know slow-mo. I adopted a rescue pointer mix during the winter months in New England, which makes it nearly impossible to get the kind of exercise my super hyper, very active and ADHD dog, Brian, needs. Today we had an hour and a half of running in our 2 acre yard and he STILL is crying to go out again. He actually chewed the rail on our deck (where we let both of our dogs hang outside during nice weather) to get out. Inside and outside, he will not pay attention, is always distracted, and just goes goes goes. I’ve rescued and fostered for over 25 years but have NEVER had a dog that I cannot tire out. It’s seemingly impossible. And like many of your other commenters have said, it’s very challenging to train him. We’ve got sit and high five down (but only when he wants to pay attention) but everything else is a bust after 5 months. Especially “come”. I honestly don’t know what to do with this guy anymore! Dog walker isn’t an option (they’re super expensive where we live) and I think even walks would not do the trick since they’re only 30 mins. We’ve done dog parks too – and he’s completely nonplussed by the exercise after 2 hours of chasing a herd of dogs around. Help! Oh gosh, that does sound hard. My weimaraner is pretty high energy but he’ll at least lie down and rest when he knows I’m busy working. We do a good hour to 90 minutes of walking a day. That seems to help. We do a 5 or 6 mile leashed run Saturday mornings and then go to a 1-hour obedience class. That’s the only day he is actually somewhat “tired.” You might want to try doing more training in short, 5-minute sessions in different places. Just taking him to different places might help tire him out mentally. I’d also suggest a dog backpack for any walks you do and providing him with time to run off-leash (like you are) every day. I recommend Nosework class for high energy dogs. My pit mix has some orthopedic issues so the vet said no agility jumping, and I decided to try a nosework class. I was surprised to see my dog working enthusiastically at finding the odor, and she is much more relaxed afterward. We have a very energetic 9 month old Lab mix. The best ways we have found to tire him out besides his daily walks are fetch in the water, he loves to swim,Playing with other dogs as well as a laser pointer, believe it or not he loves to chase the laser around the house like a cat. he knows the sound of it turning on and freaks out!That way we can relax a bit while wearing him out. My weim loves to chase a light too but he seems to get too hyper/obsessed so I don’t use it. I’m afraid I’ll make him even more hyper/nutty! I like the swimming/fetch idea. For my 9 month old cheagle, Zeke, (beagle/Chihuahua) the best activity I’ve come up with is similar to the flirt pole. I tied some raccoon hide to a stick and fling it around the yard. It is her favorite activity. It’s fun and easy for me, it challenges her agility,and solidifies her basic obedience including “drop it”, and Heel. Most importantly though, it wears her out! Love the idea about a raccoon hide on a stick! Great creativity there! Carmella (patterdale terrier) loves to chase anything that moves. In order to get her to drop it faster I always have at least 2 toys to play with (most likely same item – like 2 frisbees or balls of the same color). She’s always interested in the toy I’m holding! For my dogs(7 year old Bullmastiff, 22 month old Bull Terrier, and 6 and 7 year old Scottish Terriers I taught them to run next to my golf cart. Our typical day consists of running 3-5 miles next to the golf cart, 30-60 minutes of agility practice, 20-30 minutes of flirt pole, and 20 minutes spring pole plus mind games and obedience. That’s for an average day. A couple days a week we also do uphill fetch, swimming, hiking, and once their harnesses come in we’ll be starting weight pull. My German Spitz / Husky / Cocker Spaniel mix (however the heck That happened . . . ) is turning 8 years old in July and he Still hasn’t slowed down. I can run him on stairs, make him fetch on land, then water, let him tussle with the new puppy (8-months old), and then play a game of in door, out door (we start in the screened in pool area aka lanai, I go through the door on the far end, he goes through the dog door on the other end and runs around the lanai to get to me, then I step into the lanai and he runs around the lanai to go through the dog door to get to me). Oh, we also do “find it” with diving sticks – he’ll put his head underwater up to 20 seconds to get that stick. When we’re at the dog park it’s rocks rather than balls he wants to play with in the water and he’ll submerge even longer. I’ll throw a reasonably sized rock in, he’ll dig up one as big as his head! It’s always a hit with folks and we’ve yet to come up with a useful task for this skill because he won’t dive. I guess if I ever drop my keys I might be saved by Momo the Water Miner. He gets bored with each game after about 15 minutes. By the end *I’m* exhausted from trying to think of new things to work his body and brain. The only thing that tires him out is another obsessive dog! He hyper focuses on the ball, a laser, the puppy, food, squirrels, crows, anything that moves or will move. He was definitely a poor match for me for my first pooch, but he’s my boy. I think he needed a career 5k runner to adopt him instead! He’s über fast and despite his tail being docked he’s quite agile, though he wipes out when he gets going too fast and tries to turn. He’s learned to use clumps of grass as a pivot point by grabbing them with his mouth and swinging around. When he misses and tumbles he gets right back up and keeps moving. He’s a 34-lb maniac. To this day I’m not sure if he was sandbagging when I got him (he was sleeping next to a kiddie pool) or if his brother and sister are even More energetic than him (they were jumping all over the place and barking). I keep waiting for his Golden Years to mellow him, but this guy isn’t interested in such tomfoolery. At least he does know how to settle in at night. Mostly. We hear him once in a while moving around, but a, “hush” command usually does the trick. Unless there are armadillos swimming in the pool or a raccoon investigating the lanai. Country living is often exciting rather than quiet. We have a great mixed breed, who at 5 months is 51 pounds. He is very high energy, so after he has his run in the morning, naps, and he’s ready to go again. We aren’t. So I advertised on Nextdoor for a nearby playmate. We rejected one, because he was too rough for our boy, but found two that worked. One’s dad was hard to schedule with, but the other one is perfect! a 95 pound weimaraner who is 1.5 years old and they are perfect playmates. His parents are available almost daily, and we both have fenced yards. They play until they are both worn out for a day and a half. My 10-month old ended up with a toe fracture because my boy doesn’t know when to quit. She’ll go in for water and he’s still nipping at her heels. They ran full speed willy nilly to the patio and she cracked her foot on it, twisting her toe, gaining a small fracture. So I’m equally glad to hear you passed on the rougher playmate. Poor Gertie is on 4 – 6 weeks of restricted activity. However, that meant I had to get smart. I took advantage of having a captive audience and worked on training. Now that she’s putting weight on it I’ve got her doing puzzle toys for her meals. My boy is a boxer/whippet mix. I found that running with him makes a world of difference, even if it’s a short run. For example, running for 25-30 minutes gets better results than a 3 mile walk. Not sure why this is the case, but am happy to have found something that is a lower time commitment. We’re going to be training for a 10k together. One of us needs the training, the other was born ready. I fast-walk my large mixed breed, Peyton, at least 2 miles every day, let him rest awhile, (and me) and then later we go out in the yard. While I work outside, I throw a ball or frisbee for him for about 1/2 hr. This helps to mellow him out a little. He’s only 1 yr old, so this only helps a little, but at least it gives me a break!